At 1 pm CET today, the recipient of the 2011 Astrid Lindgren Memorial Award is announced. You can follow the announcement live on our webpage and find out directly who will receive the world’s largest award for children’s literature! Directly after the announcement, information about the winner(s) will be presented on the same page. 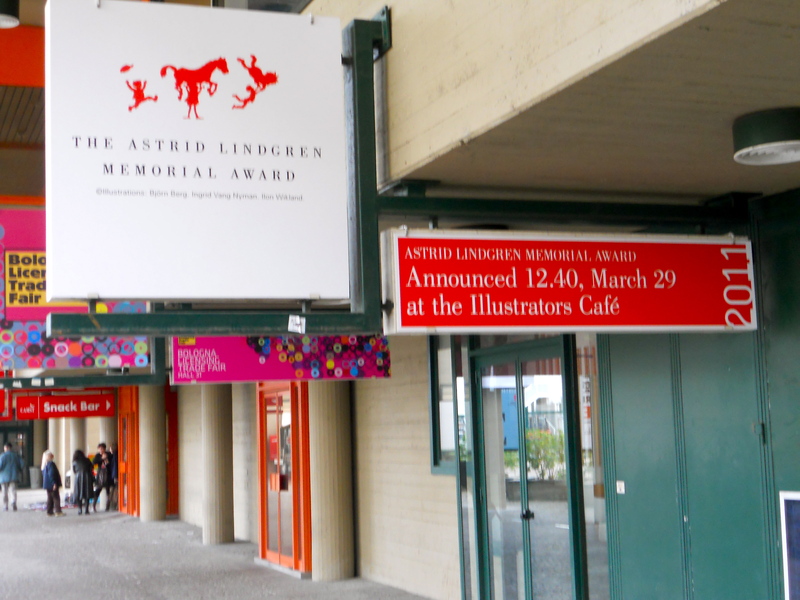 In other words, they cannot miss that the recipient of the 2011 Astrid Lindgren Memorial Award is announced on Tuesday at the Illustrator’s Café! There you can learn more about the Astrid Lindgren Memorial Award and previous recipients. Welcome! Precisely 24 hours after the announcement of the 2011 Astrid Lindgren Memorial Award, the theatre group at Junibacken will stage a performance based on the work of the winner(s). Mikael Kallin, artistic director at Junibacken, will follow the announcement closely on www.alma.se and immediatly afterwards start to create a show based on the winner(s). In the short period of time of just 24 hours research will be made, the play will be written, costumes will be created and roles must be cast. At 1 pm on the 30th of March, the result will be presented to the audience. “In addition to being a really fun project where Junibacken is put to the test by having write and rehearse a show as well as arrange set design and props in 24 hours, this is a way for us to present the recipient’s works for the children! We want to support this important prize – it’s amazing that the world’s second-largest literature prize is dedicated to children’s and youth literature” says Mikael Kallin, artistic director of Junibacken. Everyone is welcome to Junibacken at 1pm to see the result. The award office will certainly be there! Now there’s less than a week left until the 2011 Astrid Lindgren Memorial Award is announced at Astrid Lindgrens Näs in Vimmerby, Sweden! Astrid Lindgren Näs is where Astrid Lindgren was born, more than 100 years ago. Her childhood home is still intact and is open for visit all year around. A must for anyone interested in Astrid Lindgren’s work, since the environment at Näs was the source of much inspiration for her books. Next to the childhood home stands the pavilion, the cultural center, where the announcement is held. Present at the announcement in Vimmerby is, of course, chairman of the jury Larry Lempert together with jurymembers Maria Lassén-Seger, Ulf Boëthius, Ulla Lundqvist, Lars H Gustafsson, Mats Berggren and Birgitta Fransson. Just before 1 pm CET, Kerstin Brunnberg, chairman of the Swedish Arts Council will greet the audience. After which Larry Lempert will read the jury’s citation and reveal the recipent(s). The announcement is followed by a presentation of the winner(s) by jurymember Maria Lassén-Seger. The whole event will be broadcasted on our website as well as directly to Illustrator’s Café at Bologna Book Fair, Italy. This year Salon du Livre looks north. Under the heading Les Lettres Nordiques, 40 Nordic authors will participate in debates and seminars, the largest number ever. The Swedish authors writing for children and young adults include Annika Thor, Ulf Nilsson, Johanna Thydell and Ingrid Olsson. A large exhibition of Nordic books in their original languages and in translation into French will be on display. Also, the 2010 recipient of the Astrid Lindgren Memorial Award, Kitty Crowther will be there! She will talk about her work in the Nordic Pavillion on Monday, together with Jury Member Ulla Rhedin. Here you will find the details of the program. For an interesting overview of Nordic children’s literature (in French), we recommend this article in Le Monde. So if you are planning to meet spring in Paris – don’t miss Salon du Livre. On the evening of the 28th of March, Kitty Crowther opens her new exhibition at Sala Borsa in the center of Bologna. Could there be a better way to get in the mood for the announcement of the 2011 Astrid Lindgren Memorial Award on the 29th? The exhibition features Kitty Crowther’s original illustrations inspired by the city of Bologna. It is curated by Hamelin, the cultural association which promotes illustration, organizes workshops, lectures and exhibitions. At 20.30 on the 28th the exhibition is formally opened and it can be viewed until the 18th of April. 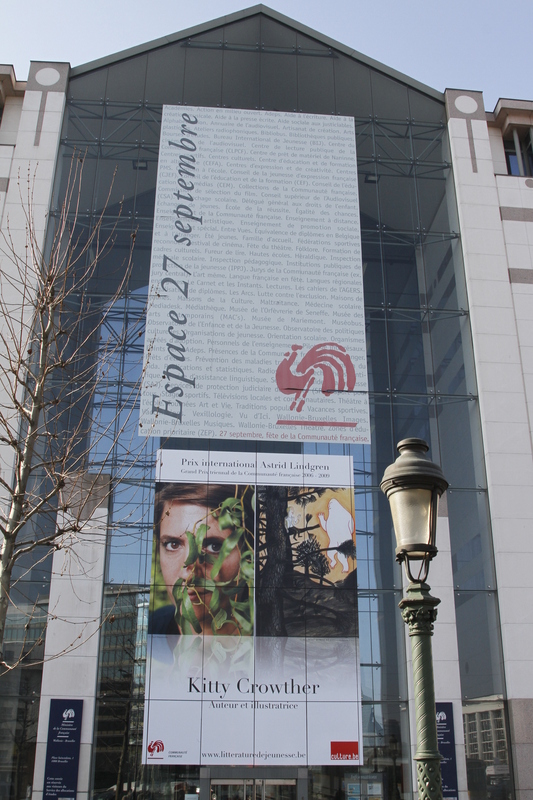 The building of Communauté Francaise de Belge in Brussels has just been decorated with a huge banner to celebrate Kitty Crowther – as the winner of the Astrid Lindgren Memorial Award and their prestigious Grand Prix Triennal (2006-2009)! Since 2000, a group of students at the Urban Secondary School of Sundern, Germany, produce one hour long radio programs called Radio Rasant. These award winning programs are relayed locally on FM and around the world through short wave and internet. 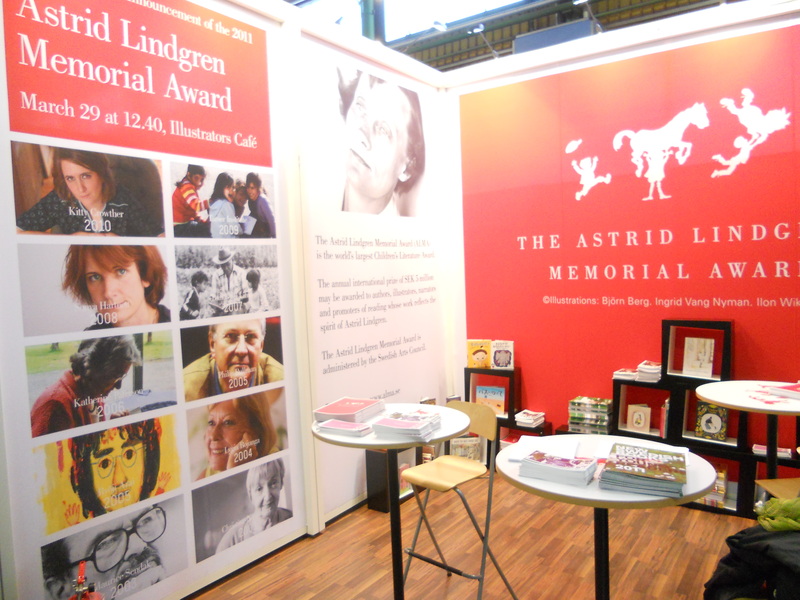 The Astrid Lindgren Memorial Award has been part of the program since the award was instituted. In fact, the German students have travelled to Stockholm for the award ceremony and to personally interview the winner on several occassion. At the award office, we look forward to welcoming the students of Radio Rasant at this year’s Award Cermony in May. Curated and designed by a panel of 100 dedicated children from all over the world, the brand new Guardian children’s book site will be very interesting to follow. Children can read reviews, participate in discussions, competitions, ask questions to their favorite authors and much more. For the same reason that I think it’s important that they breathe, eat, drink, sleep, run about, fool around, and have people who love and look after them. It’s part of what makes us fully human. Some people manage to get through life without reading; but I know that if I’d had to do that, an enormous part of my mind, or my soul if you like, would be missing. No one should be without the chance to let their soul grow.